OpsCenter has been designed to be easy to configure. That is because an organization’s processes will likely be different from the defaults in OpsCenter. A non-technical person can reflect your methodology, processes, and procedures in the software. However, OpsCenter's default methodology provides a good start point to envision how the software can fit into your organization's response model. In the default methodology, an incident is a situation that either exists or is anticipated which warrants the attention of the response staff. Some incidents have significant events that occur as the incident unfolds that may materially change the nature of an incident. For example, an incident might be "Hurricane Nicholas" and a significant event might be "Power goes out in region". In OpsCenter you record the information about incidents and significant events with the Incident Form and the Significant Event Sub-Form that resides in it. The incident information can be kept current by adding or editing information during the life of the incident. As a situation unfolds, it is not always clear how incidents or events are related. OpsCenter is designed to manage multiple incidents simultaneously. The system provides the ability to group or ungroup incidents and events. It also provides the ability to name incidents. 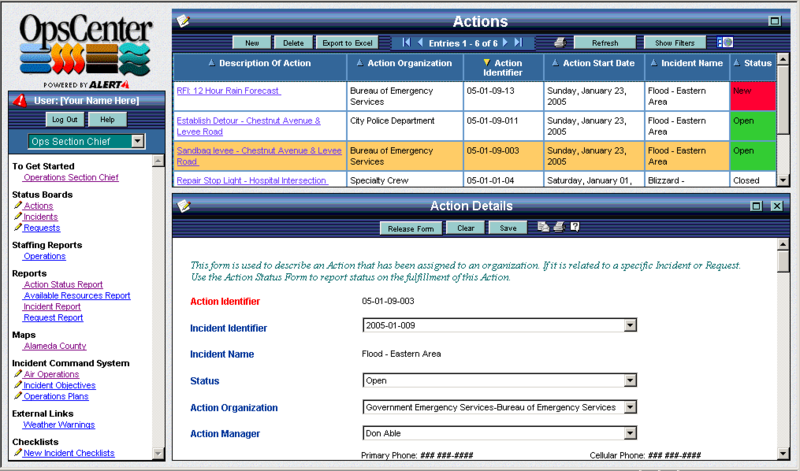 The other features of OpsCenter, such as allocating resources, filling out checklists, journaling and so forth keep the information related to different incidents separate. This allows multiple incidents to be managed without confusion. As incidents unfold, responders may require assistance. They typically request this assistance from the response staff. The request is submitted and maintained using OpsCenter's Request Status Board and Form. The status board shares the information with users who have the appropriate visibility and permissions. The response staff can assess and prioritize each of these requests and respond according to your plans and procedures. After an incident is reported, an assessment of the situation and response begins. This response is usually composed of a number of actions that must take place. If there is not a preplanned response for a particular incident, the response actions are determined as quickly as possible and initiated. In either case, these actions need to be carefully managed if the response effort is to remain under control. OpsCenter provides an Actions Status Board and Form to manage these actions. When an organization is assigned an action, it is entered in the Actions Status Board so that it may be tracked. The organization is informed of the task either via automatic notification, e-mail, or by observing it on the Actions Status Board. For each action, it is possible to designate its related incident. Therefore, actions for multiple incidents can be managed simultaneously with out confusion. You can also designate what resources are allocated to each action. Once allocated to an action, the particular resource is no longer considered available for other actions. For each action, you can assign a priority and a due date and time. OpsCenter is configured to notify certain roles when actions are due or overdue. The system also provides a variety of reports related to the actions that are taking place for a given incident, their statuses, the resources in use, and so forth. For each action in the system, the organization fulfilling the action can provide the status of the current activities taking place to support that action. This information is provided on the Action Status Form. On this form the organization also can list which resources are currently in use as part of the action and any significant events occurring while fulfilling the action. OpsCenter provides an easy to use messaging mechanism that allows messages to be sent back and forth between roles or sections on almost any subject. This capability can be used to support incident related message traffic. The system provides Status Boards, Forms, and Reports for additional information affecting the response to incidents. Some examples include road closure information and weather. 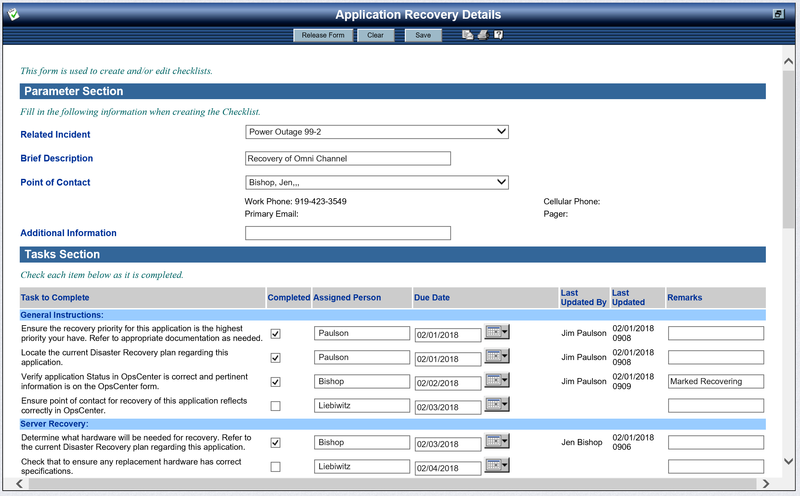 Checklists within OpsCenter reflect your procedures and help responders work according to your plans. Familiar terminology helps users quickly understand the tasks. OpsCenter's automated journaling and reports free up much time that would otherwise be dedicated to tedious paperwork. Consequently, users can spend more time focusing on managing and controlling the response according to plans. In addition, these features help the staff quickly submit required reports and so forth after the incident.